The sudden arrival of winter weather in Montreal means that many students have had to swallow another metro fare hike and escape into dingy metro stations to commute to and from Concordia. However, the number of bicycles waiting outside several classes point to an increasingly popular alternative mode of winter transport: winter biking. Kelly Pennington, an urban planning student, commutes to and from her classes at Concordia by bike. Sporting lobster-claw-styled cycling gloves, she enthuses that the rewards of a brisk and refreshing winter commute to school easily surpasses any challenges she faces riding in less-than-ideal circumstances. According to a recently published study by civil engineering and applied mechanics researchers at McGill, the amount of people using their bikes to get around in the winter per day numbers in the hundreds and has been increasing steadily over the years. Community bike co-ops catering directly to students have sprung up across the city, like Le Petit Vélo Rouge at Concordia, The Flat Bike Collective at McGill, Université de Montreal’s Biciklo and BQAM at UQAM. They sell and fix bikes, as well as offer workshops specifically centered around the problems cyclists may face when riding around Montreal in the snow. 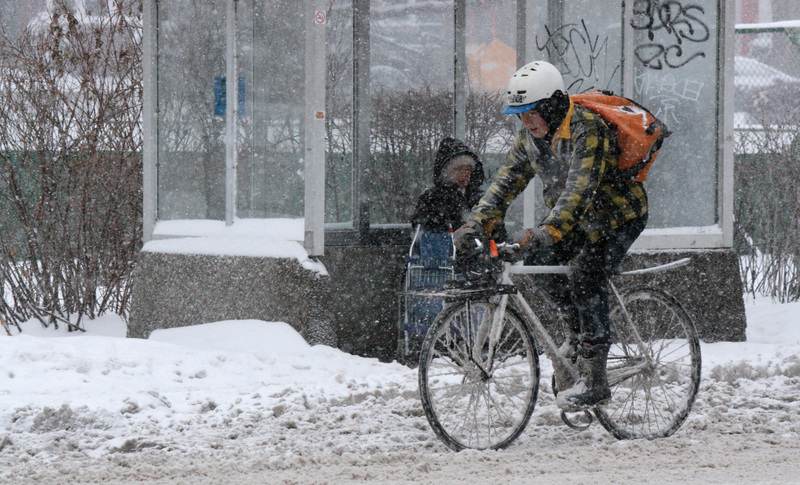 Nonetheless, many winter cyclists face challenges beyond the cold weather. “One issue is that drivers don’t see this as positive, they think it’s stupid,“ said Pennington, who also works as a bicycle courier. She explained that long stretches of designated bike paths are often not cleared of snow during the winter, and drivers are not only annoyed but also scared at having to share narrower roads. When the snow is cleared it gets dumped onto the sides, usually spilling over onto the bike paths and forcing cyclists to share the streets with drivers. Pennington said she gets honked at more during these winter months. Balancing on the seat of her locked bicycle in front of the JMSB building, Karine Imbeault mirrors this experience. She commutes from the Plateau area and says she often gets yelled at. Both Pennington and Imbeault said that the best way to deal with exasperated drivers is to not be distracted by the honking and name-calling but remain defensive while riding. Remaining visible to drivers becomes even more important as it gets darker earlier so avoiding dark clothing and affixing bicycles with battery-operated lights is advisable. Imbeault points out that batteries die faster in cold conditions so she finds herself spending more money on them during the winter. – Modify the handle bars to point towards you. This has the benefit of not only being more comfortable but also allows for proper weight distribution onto the rear wheel which prevents sliding on slippery surfaces. – Get a single gear bike. All movable parts of the bike will freeze. Having a single gear reduces the potential damage caused by the constant freezing and thawing and reduces the maintenance required. The brake system and the brake pads against the wheel will freeze when left for hours outside classes so you may have to gradually loosen them by periodically squeezing them. – Let a little air out of your tires when riding over icy or wet surfaces. This allows the tires to better retain their grips on the roads.